A wonderful run of antique iron seedling cloches / protectors. 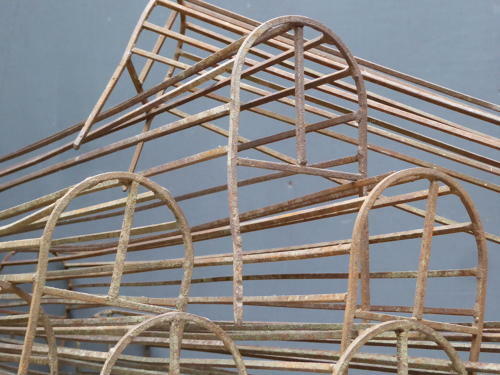 A fabulous collection of estate made iron seedling cloches which would have been placed over the top of young seedlings in a vegetable patch or garden in order to protect from birds & other wildlife. Decorative, very usable & not something which turns up very often! Price is for a run of four cloches with two sets available. Wear commesurate with age, untouched original condition. In good order with expected wear & signs of age to the ironwork, one cloche has a couple of cracks to the joints of a single bar (see last image). UK courier service available at £15 per set of four, tracked & signed for 24 hour delivery.